We know how important a bright smile is for our patients in Omaha, NE. In order to remove discoloration, we help brighten smiles with two very different cosmetic treatments. In today’s blog, we’re looking at the difference between in-office and at-home teeth whitening procedures. Which one will be right for your smile? Why do teeth stains form on our smiles? They may occur due to poor oral hygiene, which enables plaque buildup to accumulate. Plaque makes discoloration more apparent, in addition to increasing the risk of tooth decay and gum disease. Drinks with dark pigments, including tea, coffee, red wine, soda, and fruit juice, also cause discoloration. Smoking and tobacco use will also stain your smile and sugary/starchy foods promote the plaque buildup behind some cases of visible discoloration. Understanding the causes of your stains can help you make better choices to prevent them, allowing the results from your whitening treatment to last much longer. If you need a fast touch-up, for example, if you have an interview coming up, then you may consider our in-office whitening. We apply a protective covering over the lips and gums before placing a bleaching gel onto the teeth. Suing a curing light, we activate the gel, which then break up the stains on the teeth. The entire procedure only takes one visit to complete, offering a whiter smile in as little as one or two hours. 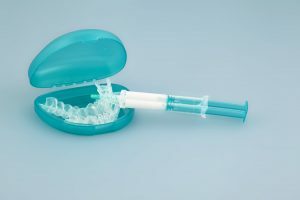 For those who prefer a home-based solution, or those with more substantial teeth stains, as well as sensitive teeth, we may suggest our at-home option. The patient comes for a brief visit, during which we create a set of plastic trays. We then send the patient home with the trays and a powerful bleaching gel. Each day, the trays will be filled with gel and worn for a set amount of time, usually between 30 minutes and 45 minutes. The total treatment time varies, but usually takes place between a week and ten days. Following treatment, many enjoy a smile brightened by multiple shades. If you would like to learn more about either of our whitening options, then contact our team today. We’re ready to help you enjoy a brighter smile, one that will bring you confidence! At Pacific Hills Dental, our team wants to help you enjoy a smile free of dental discoloration. Talk to our team about cosmetic treatment options. To make an appointment for yourself or for a family member, call our Omaha, NE, dental office today at (402)330-2243. We proudly treat individuals in Omaha, NE, and all of the surrounding areas, including Papillion, Elkhorn, La Vista, and Millard.